Imagine going to a mechanic and being told that you need a new car because your old one has a rusty tailpipe. That’s kind of what happened to today’s featured homeowner. Except rather than being told she needed a new car, she was told she needed a new furnace. And rather than citing iron oxide (rust) as the reason, the repairman cited zinc oxide – in other words, zinc rust. It’s the “scary” looking white powder pictured below. It came from the furnace’s exhaust pipe to the left. Of course Rindle Replacements didn’t call it zinc rust. The middle of their invoice (pictured below – click it to enlarge) refers to it as “a lot of improper combustion”. Improper combustion on a furnace of this type produces black soot, not white oxide. 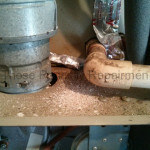 It also states that the “inducer motor is really loud, blower is dirty, heat exchanger has large thermal stress marks”. The noise and dirt comments are severe exaggerations. And the stress mark comment is a variation on the hot spot lie. So called hot spots are explained in this post. Unlike a car’s tailpipe, a furnace’s exhaust pipe is outside the furnace. 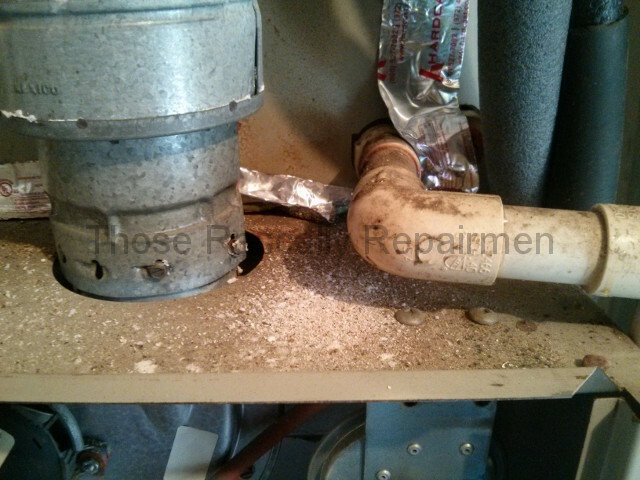 That means their recommendation to replace the furnace was for something that’s not even a part of the furnace! You could say that Rindle’s ability to see black when there’s actually white is deserving of some colorful language. Next Next post: Cheap and Good?